Easy WebContent is simply the easiest and quickest way to access your pages to create and/or edit your website from any standard web browser – without installing any software on your hosting account or making changes to your existing HTML web pages. 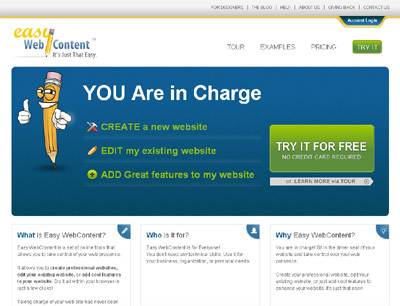 More than just an editing system, Easy WebContent is easy, powerful, saves you money on editing and gives you control over managing your web site content. Easy WebContent is a collaborative effort between professional web designers and developers at HindSite Interactive, Inc., an internet consulting company providing custom web solutions to businesses and organizations since 2001. With the demand for a quick, simple and cost effective method of web site editing, in 2008 we made a conscious effort to create Easy WebContent. This fully web based WYSIWYG system allows website owners to access and manage their site content with no technical training or costly out of pocket expenses. No matter what the level of web design knowledge or whether it is a multimillion dollar business or a start up company, Easy WebContent was designed with every business in mind.